For many years my dad had a sharpening business. 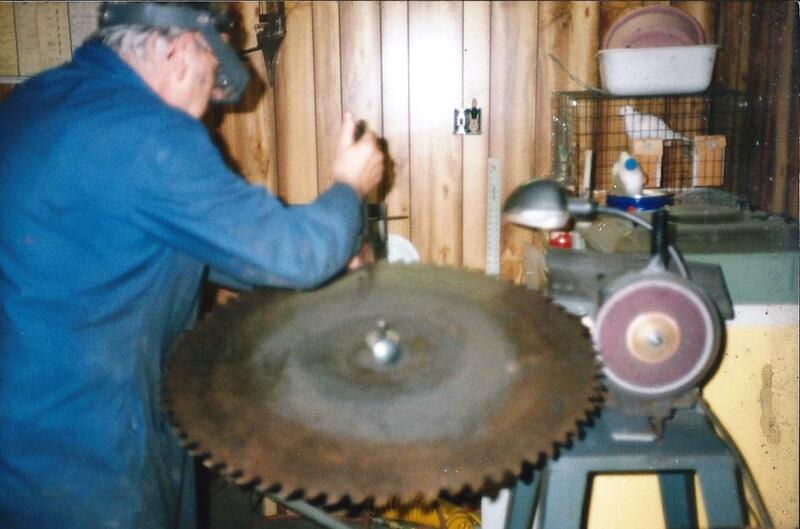 He began with a machine to sharpen his own chain saw chains and grew to a shop full of equipment so he could sharpen just about everything (including wits!). He became well-known for his sharpening as well as someone who enjoyed visiting and keeping current on events of the community and country. When Dad would come in for lunch or just to take a break during the day, before long we’d hear him say, “I’d better keep everlastingly at it” and out to his shop he would go. Five years ago today I got the phone call I had always somehow dreaded. My dad had a heart attack and didn’t make it. I had talked to him just a few days earlier on my birthday but now he was gone. My world began to crumble around me. My dad and I had a special relationship and the blessing of a closeness few fathers and daughters have. I didn’t know how I could go on living without my dad. But on that plane ride halfway across the country to be with my mom and sister and say “goodbye for now” to my earthly dad, somewhere deep inside my soul resonated, “be still and know that I am God.” It is impossible to explain how that soothed me in the midst of my sorrow, for while I couldn’t imagine going on I knew I would, and I could. Although my earthly father was no longer with me I have a Heavenly Father who is omnipotent God and will never leave me. Even in the midst of the sorrow and uncertainty in my mind God knew what the future held, and with Him beside me I could “keep everlastingly at it” until I understood it too. What uncertainties are you facing in life right now? Do you have uncertainty in your job, your family or your friendships? Do you look at the future and wonder how you can go on? I encourage you that no matter what you face to remember that God is still in control. He doesn’t promise that it will be easy or that you will always understand but He does promise to be with us and to be God in the midst of our circumstances if we allow Him to. When we put our trust in Him and keep everlastingly at it we will have peace in the midst of the puzzle of our lives. Looking back over the past five years I see so much growth in my own life. I have pushed myself to try things I didn’t before and have had to learn things that I never imagined I’d be doing. There have been plenty of tears along the way but much joy as well. I still don’t know what the future holds but God knows the ending I can’t see. He sees the woman He will continue to mold me into as I allow him to work through my sorrows, my struggles, and my successes. He knows your future too and longs to mold you and lead you face together whatever lies ahead. I hope today you will look ahead with hope and just like my dad, keep everlastingly at it. God will be there too. Thank you for sharing your heart. My day is more reflective and thoughtful because of these words. Praying you have a blessed day.